Bring the fresh air indoors with a custom made storm door. Your family’s protection is worth it! Protection – Add another layer of protection and safety to your home. Insulation – The insulation storm doors provide keeps your heat inside in the winter, and your air conditioning inside in the summer. Durability – Resilient professional-grade storm doors by ProVia use aluminum that is 20% thicker than the doors at the local home improvement store, providing long-lasting toughness. Customization – There are hundreds of ways to customize your new door to fit your unique needs, style, and taste. Options – Select your style, color, hardware, and glass with guidance from the experts at Kelly Window and Door. Warranty – Professional-grade storm door installations are covered under material and labor warranties. With your storm door’s heavy-duty, non-removable stainless steel screens, you can enjoy the natural light and refreshing breeze while ensuring the security of your home. And they provide the ideal set up for keeping children and pets safe inside your home as you enjoy your day. Choose your beautiful storm door from a variety of stylish designs for instant curb appeal. Choose from optional features including retractable screens at the top and bottom of your new door for greater ventilation. ProVia’s aluminum storm doors are available in multiple colors, and the Spectrum, Decorator and Deluxe series feature many options for your new door’s glass, including exclusive Inspirations™ Art Glass. Homeowners appreciate the multiple customization options for full screens or top screens on their new door. Avoid the need to buy any tools, work with subcontractors, or find a way to transport your new door to your home. With a full-service installation company like Kelly Window and Door ready to manage your door project from beginning to end, you can rest at ease. Kelly Window and Door installs premium ProVia storm doors, which offer the highest level of customization with 54 models of aluminum storm doors and numerous additional glass options. 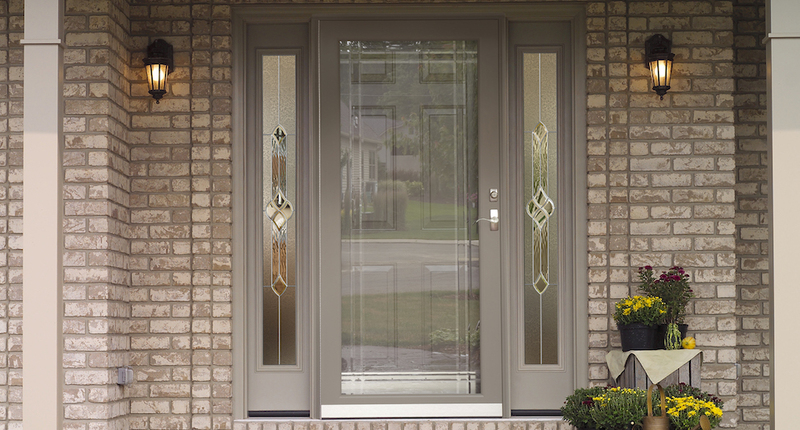 Their storm door products appeal to the aesthetic and functional needs of any home. With options available to cater to many different design tastes, the possibilities are endless. Whether you desire a storm door for your child’s safety, your added security, or your increased energy efficiency, a dependable, beautiful storm door awaits. Simply call Kelly Window and Door at (919) 461-0010 to schedule your in-home consultation or showroom appointment. Your new door project will be implemented from concept to completion by caring professionals. Great job! Top notch door. I already recommended you to my next door neighbors and others on the court. Installers were professional, respectful, and kind.